Verisign publishes a monthly blog post highlighting domain registration keyword trends from the previous month. Each list is developed by examining keyword registration growth relative to the preceding month, such that those keywords with the highest percentage of registration growth are being reported on. This methodology was used in the chart to the right, but is representative of the preceding quarter. This method is intended to highlight the new and changing keywords seen in .com and .net domain name registrations. By evaluating the keywords with the largest percentage shift, the top 10 that have seen a significant shift in end user interest quarter over quarter can be identified. 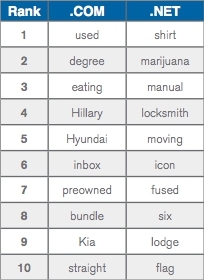 Top 10 trending keywords you can use for your own ideas, for name of website of for content marketing, why not?